I employed my usual strategy of refraining from web research, reading back labels or tasting notes, but I knew, I just knew in my heart-of-hearts that this wine was going to be heavy on the ethanol. No surprises to follow. 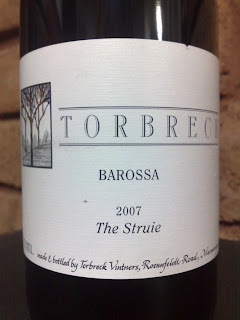 And there’s no introduction required to this Barossa producer so I’ll throw myself headlong into the task of bringing you a snippet of Struie – a 100% shiraz from the Eden and Barossa Valleys. Deep, inky, blood-red with purpling edges. Kind-of exciting to see this colour – you know you’re in for a biggie. Dense dark plum and liquorice greet on opening, with some syrupy mocha and punch of pencilly oak. There’s mint and spice – cinnamon and clove, white + black pepper. It’s brambly and earthy with a touch of savoury tomato, while the fruit spectrum covers the dark and brooding black stuff to rich, red and blueberry aromas – it’s raisiny and sweet-smelling. Other characters I jotted down include caramelised fig, toffee apple, vanilla pod. It’s lush and plush. The palate is red-fruited raisins, some blackcurrant slipping through, white spice and pepper and a little star anise mintiness. Chewy and flavoursome – savoury like rich, slow-cooked ragu, or tarry backstrap molasses, and sweet like a fiercely baked blackberry pie. This wine is cookin’. Rounded and complex, texturally soft and pliant – the tannins seem to be either very fine, or softened. The alcohol fleshes out the back palate with the dense, yet sinuous oak. They’ve really backed off the structural elements – tannin/acid – to bring you a wine of suppleness and flavour. Viscous to all hell. I enjoyed this. It was worryingly drinkable for a high-alc style. But to be honest, it doesn’t really have the X-Factor that you would expect from this label, and you know I love an X-Factor. Yes, the alcohol shows (it says 15% on the label, but who knows? ), but it’s not overdone for the style of wine. I think I enjoyed the recent bottle of big-alc Kay Brothers more than the Torbreck (see here for the Kay’s) but altogether this was an enjoyable beast over two nights – one with pizza, and one with lamb roast. Is good, is Torbreck, is not cheap, is not short of fans, is worth a look. Value: Current release (2009) is $48.50 at cellar door. I vaguely recall buying this 2007 for $40-ish somewhere, so that makes sense. I think it’s OK, considering The Factor is currently $125 and The Laird $700. Producer: Torbreck – www.torbreck.com – established in 1994 by Dave Powell, formerly of Rockford. A share-farming and semi-virtual enterprise until the 2000’s when they acquired their own property – the Hillside vineyard in Lyndoch – and established their own winemaking and cellar door facility on a nearby property. Region: Barossa and Eden Valleys, South Australia. Eden provides the varietal clarity and structure while the Barossa provides the power. Site: 40 year-old Eden, 80 year-old Barossa. Winemaking: Matured in old and new French oak for 18 months. Vintage: Eden was hot, the hottest for a long time. The preceding winter was dry too. A little rain in Feb eased the pain. Early, short – yet she was a hottie and correspondingly a goodie. 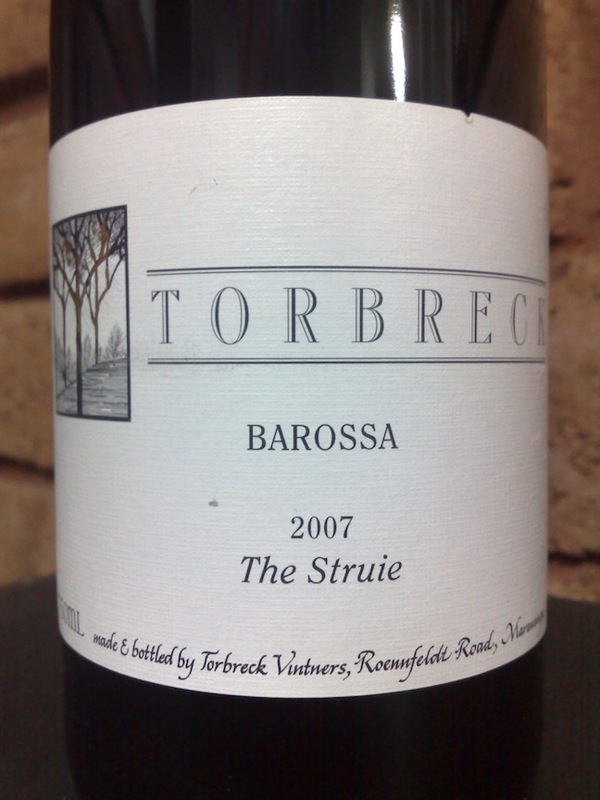 Much the same in Barossa – an early and short vintage, low yielding, but some good quality amongst the carnage.